In 1891 fifty open wagons were order for the M.R.W.A. to the same design as that used for the G.S.R. open wagons with a distinctive gable ended arrangement. Initially the wagons were numbered 1A-50A but were soon renumbered to 17-66. An additional thirteen wagons (51A-63A) became 67AB-79AB at some point before 1911. 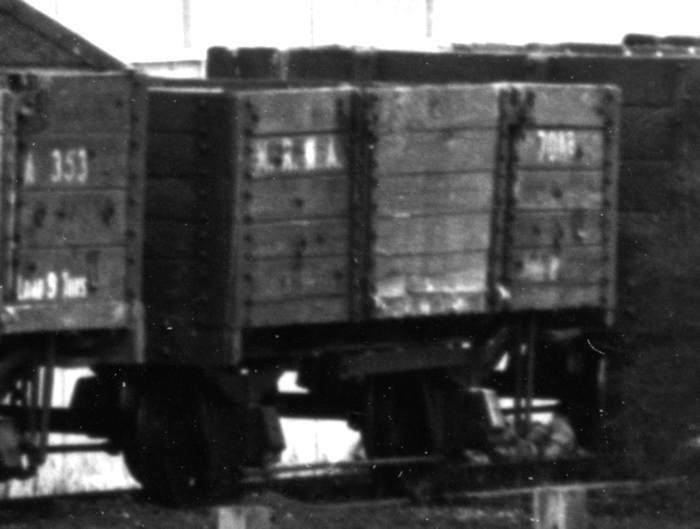 These wagons had conventional ends but although the sides were the same height they had 5 narrower planks rather than the 4 broader ones of the first 50 wagons. In 1914 numbers 17-25 were renumbered 351-359 and later (possibly 1927?) numbered 31-33 became 297-299. In 1931 number 62 was converted to a G class water tanker and at some point between 1912 and 1927 so were A37,A46 and A57, AB68, AB74, AB76 whilst A353 and AB69 were converted to class GR. G62 and G68 had been reconverted by 1931. Numbers 72 and 75 seem to have been written off at some point before 1929, possibly due to accident damage. In 1950 the M.R.W.A. hired four W.A.G.R. GA class open wagons and numbered them A1000-1002, 1071. In 1953 these were purchased and became A319-322. The wagons involved were GA6157, 5268, 5978 and 5437. In 1959 numbers A319 and A321 were written off followed by A320 and A322 in 1964. Some AC type wagons were also classed as A for reasons which are not now clear. These are listed under class AC.